Paul Stanley Prantis was born on September 24, 2010, at 5:22 PM, weighing 7lbs 7oz, and measuring 21 inches. I woke up Friday morning, and after cuddling in bed with my darling kitty a while I started to feel a pressure in my lower abdomen. I just figured I needed to use the restroom (I had lost the ability to tell when I needed to go other than by pressure when lying down or sitting sometime in month eight), but when that didn't make it go away and I started to feel the pain get worse and then subside a bit in waves, I started to suspect it might be time. I went and woke my husband, who had been sleeping on the couch so we both could get a better night's sleep knowing we had a big day coming sometime soon. The best I can describe the next couple hours is utter confusion. I had always pictured contractions as pain for a short window with a clear peak, then a break with no pain when I would get some relief, and then another wave. Instead I was in a sort of constant pain, which would clearly be stronger at some points than others, but I couldn't make heads or tails of when a contraction was beginning or ending, nor tell what counted as a single contraction as they greatly varied in strength. We woke my mom up, and she and my husband tried to get the last minute things to bring to the hospital and get dressed themselves, while trying to help a very frustrated me figure out how far apart my contractions were. Once ready we decided to just go to the hospital. Our best guess what that my contractions were 3 1/2 minutes apart, but it was really just a guess, and I was in a lot of pain. After the epidural took effect it was a completely different picture. The epidural completely blocked all of the pain. I couldn't even feel all but the strongest contractions, which presented as a slight pressure that was barely noticeable. At 11:30 AM I was up to 3cm, so I was making good progress. Generally the first 5cm are the slowest. Throughout the day Sue kept having to re-adjust the monitor that is designed to detect contractions. She would get it to detect one or two, but then it would stop being able to detect them. We really couldn't consistently detect when I was in a contraction, not even by pressing on my abdomen. Normally you can feel it as the uterus gets hard during a contraction. The problem was some mix of the variance in strength, the depth of my uterus, and that some contractions were actually lopsided and not affecting the whole uterus. It did at least make me feel a little better about not being able to tell when they were beginning and ending at home when no one at the hospital could figure it out either! You can see how much of a difference the epidural made just by my appearance. I am even smiling! By 3 PM I had unexpectedly jumped to 9cm, and we started making preparations for the pushing phase of labor. This Friday was a particularly busy day for Labor & Delivery at El Camino Hospital, so the OB was spread pretty thin running between all the different laboring women. I threw a bit of a wrench into things by getting to this phase earlier than was expected for it being my first child. So we put off starting to push while we waited for the doctor to be ready. During labor it is normal for the baby's heart rate to dip during contractions as long as he recovers and as long as they stay correlated to the contractions. But since we couldn't detect my contractions reliably, it was difficult to determine if he was dipping only when he should. As the labor progressed, the continuing and lengthening dips became more worrisome, so they decided we should go ahead and start pushing without the doctor, who would join us as soon as she could. They also suspected the cord could be around his neck, which happens for about 50% of babies. We started out pretty good. Mike and Sue could see the head after a few pushes starting to work its way through, but then things stalled when the widest point of the head needed to get through the pelvis. The pushes ideally should correlate with contractions so that the contractions help push the baby out, but we missed half our opportunities to push because we weren't sure if I were contracting or not until it was over, and as I mentioned before many of them were weak or lopsided. I was pushing plenty strong, I just wasn't getting much help from the contractions. They decided to have the anesthesiologist turn down the epidural to see if I could help determine when the contractions were occurring and we took a break from pushing while we waited for the drug to wear off. Now the general plan at El Camino is, once he's out, they lay the baby on the mother's chest, still attached to the umbilical cord and all. If the baby is willing, sometime the first feeding even occurs at this point. Mommy and baby get to bond, and then when ready Dad gets to cut the umbilical cord (which we were hoping to videotape). The baby then stays in the room with the mom for the rest of their hospital stay, where they staff show them how to care for their newborn, and mom and baby leave together two days later. Well, you know what they say about the best laid plans.... Since he had already passed his meconium, he would need suction applied right as he came out. If they couldn't clear his lungs well enough there, then they'd have to take him to the infant warmer in the corner of the room to finish getting it out. But not a big concern - happens pretty frequently. So I kept pushing, and finally I felt a pulling and then release as they helped wriggle him out. I looked down and he was purple (which is normal) and he let out a big cry and looked nice and healthy. My mom rushed to grab the camera to video Mike cutting the cord, but they had Mike do it immediately and whisked him away to the infant warmer. As I mentioned before, they lied, and I still hurt quite a bit. Sue worked on giving me more of the narcotic now that the baby was out while the doctor helped me deliver the placenta. Meanwhile my mom had grabbed the camera and thought since she missed the cord, she'd video Paul getting cleaned up. But after a few moments it became clear something was not right with my baby. 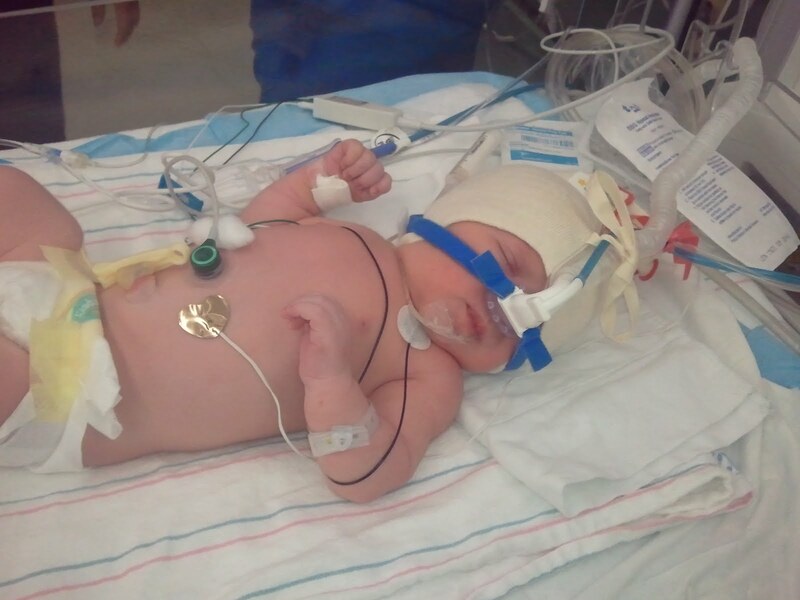 They weren't able to get all the fluid out of his lungs, and he wasn't able to breathe on his own. The called a code white, and suddenly my room was filled with about 6-8 new people I had never seen before flurrying around my baby. (I later learned this group included both a neonatologist and a pediatrician, along with several other people from the NICU.) They intubated Paul to help him breathe and continued to try to clear out his lungs. There was some kind of heavy mucus that they weren't expecting and were having a hard time getting it out. My doctor had moved on to my stitches, and I remember at one point getting a glimpse of Paul between two moving people and he was a shade of gray that no baby should ever be. That's when it hit me that my baby wasn't breathing on his own and after 9 months and the delivery and everything we had been through, I could lose my baby. 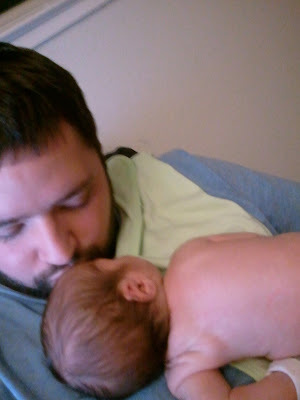 I remember looking at my husband and asking, pleading, "Why isn't my baby breathing?" My mom, my husband and I all said a prayer for Paul. Meanwhile the doctors were discussing the source of the mucus. They were worried he might have pneumonia, which is very serious for infants. After what seemed like forever, but in actuality probably wasn't all that long, they were finally able to get enough fluid out that he could breathe on his own. I was allowed to hold him for about a minute, and then he was rushed off to the NICU with Daddy in tow. I wouldn't be able to go and see him until my epidural had worn off enough that I could walk on my own, so I just laid there while everyone was cleaning up around me. After a while Mike came back to update me. They took a culture to test if he had pneumonia, but it takes 48 hours before they would have the results back. They took an xray of his chest, and there were a couple small spots that could be infection, or could be nothing. They also wanted to monitor his bilirubin since my blood type is O+ and Paul's is A+, which can sometimes lead to jaundice if the breast milk causes excessive breakdown of the baby's red blood cells. The CRP test came back elevated, but that's not really a surprise given he had just been through quite an ordeal. In the meantime he had to stay in the NICU, and he was all hooked up to various monitors, an IV, and a CPAP, but he was now a nice healthy shade of pink and it looked like he'd be just fine. He did bring me back some pictures of Paul that he took on his phone. It was around 9 PM before I first had a chance to go see him. 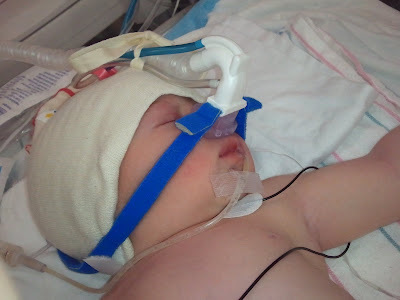 By then he was already off the CPAP and just had a nasal PAP. All three of us together! By the following morning they were able to take him off the oxygen altogether, and I was able to feed him for the first time. The next two days were pretty much cycles of eating, sleeping, and feeding Paul. We wanted to try to get my milk to come in as soon as possible to get him off of the IV. 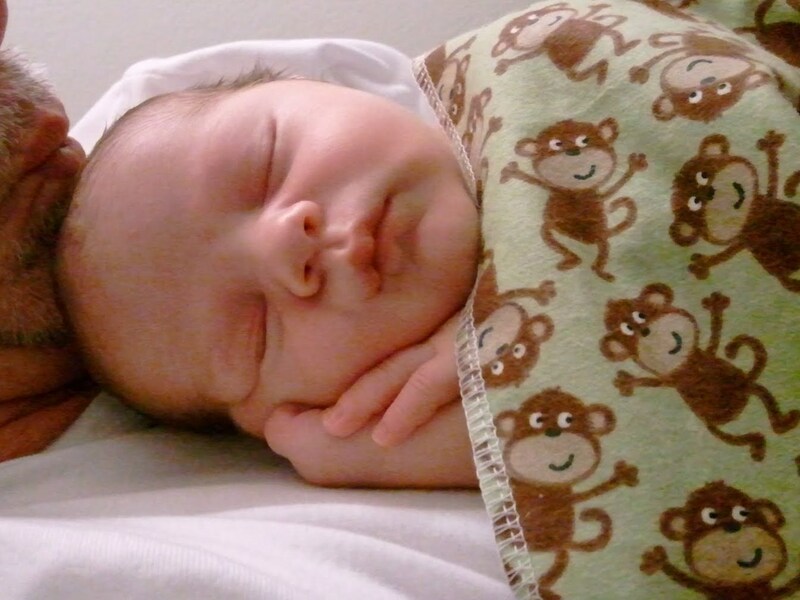 The doctors had him on a broad spectrum antibiotic in case he did have an infection, and that made him need a lot more fluids than newborns usually do, so colostrum wasn't going to cut it hydration-wise. They decided to supplement him with formula in the meantime. Luckily Paul is a little champ and we didn't have very many difficulties getting feeding down. I was discharged from the hospital Sunday evening. Since Paul was in the NICU I was allowed to checkout it in the evening rather than by 11 AM, but since his cultures took 48 hours, I was still going to have to be discharged at least one night before Paul would be out at the earliest. Thankfully I was able to get into one of the two parent rooms. It was a lactation room during the day, but during the night they opened it for parent with a baby still in the NICU so they didn't have to drive back to the hospital every two hours for feedings all night. The room just barely fit a flip out cot, a small end table, a sink, and a microwave, and it came with no one to help me get back and forth to the NICU and no other hospital support (up to being discharged I was always taken to the NICU in a wheelchair, was constantly monitored by nurses, had all meals and drugs provided, etc. ), but it meant I didn't have to leave Paul in the hospital and go home that night, and for that I was, and am, extremely thankful. The next morning all of Paul's tests, the culture, CRP, bilirubin, and xray all came back clear, so we got to take Paul home, which you can see made his mommy very happy!!! Oh Kelsey Rose--I'm so glad I became a follower so that I could catch this beautiful moment. Congratulations! I'm so glad everything worked out. I lost a baby 36 hours after her birth. It's been so long now (1983) that I rarely think about it any more, but your story brought back the memory of those tense moments right after her birth. Her problems were completely different. I'm glad your story has a happier ending. He is absolutely beautiful! I am sorry you didn't get the delivery you were hoping for, but I am glad all came back well and you were able to go home together!! Enjoy your beautiful new baby. So sweet! What a wonderful story! Your baby is just gorgeous and you are truly blessed. Congrats!!! I just found your blog via Fabric Tues, and let me say that you've got one sweet little miracle there! A friend of mine recently suffered from a stilborn birth which has made me quite terrified about birth, where as previously I was just prepared enough without worrying. I'm sure the next time around I'd be a wreak! Great story and way to roll with the craziness life throws at us!